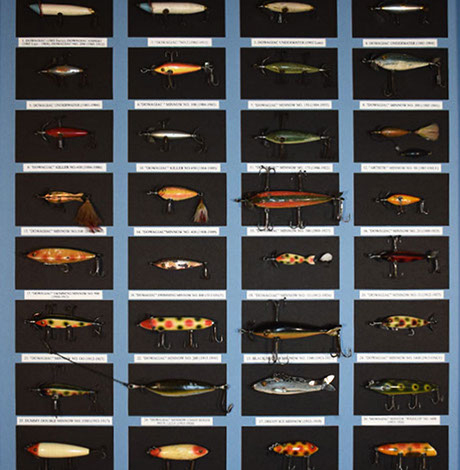 he Heddon Museum has over 2,000 lures, spanning the entire 82 year history of Heddon in Dowagiac (1902-1984), as well as prototypes - both before and during that period. Included in the collection is an early hand carved frog, two rimless cup “Dowagiac Experts”, one in its original black and silver box with paperwork, many private label lures, as well as lures made expressly for the Japanese market. There's an extensive display of every cataloged Heddon lure for which an example is known to exist, as well as several one of a kind lures. Lure boxes and a comprehensive collection of casting weights are also featured.